Have you ever wondered why the European Union’s audiovisual identity has no audio? I have. 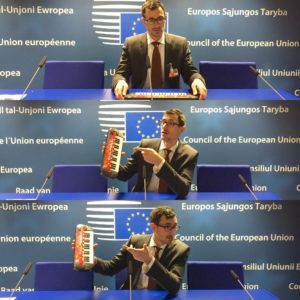 Since creating The Europe Song for the European Commission, I’ve been on a sonic quest. The idea is to help the EU develop an audio identity by the year 2022. That year marks 200 years since Beethoven started writing the tune now known as the the Anthem of Europe. Here’s how brands like SNCF are using sound to build recognition, trust and positive sentiment. They’re already proving that sound is the EU’s most undervalued sensory communications tool. Where’s the audio in EU communications? I’ve been experimenting with audio communications using music from The Europe Song. I’d designed the song as an integrated 3-part “audio pool” of melodies, rhythms and textures that can be embedded into any EU communication product. (The music is free to use for non-commercial purposes. Contact me for the 60 audio stems). Here are some of the early experiments. I’ll add more soon. IN ONE WEEK: Guess who’s coming to #Brussels, this time with 1000 letters from the UK? What is an “audio identity”? Why does the EU need audio communication? Good question! The short answer is that sound increases brand awareness, trust and positive sentiment. I think we can agree that the European Union needs some help in these areas. If you’re looking for a longer answer, join me on Twitter and LinkedIn for updates as this live blog unfolds. Or, even better, let’s talk.